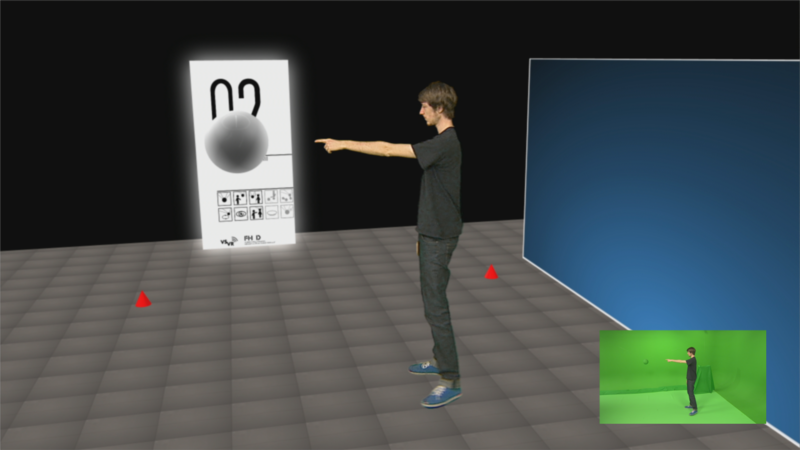 The Virtual Sets and Virtual Environments Laboratory of the FH Düsseldorf developed and tested a new visual feedback system for virtual studio applications. In order to evaluate the system, interviews with experts were arranged. The lack of stage furniture and visual clues hamper hosts' orientation in virtual sets. By installing preview monitors, virtual studios try to overcome this hindrance. Showing hosts or actors the composite image might provide an idea of their surroundings. But such aids fail, when it comes to giving exact information about the virtual set. 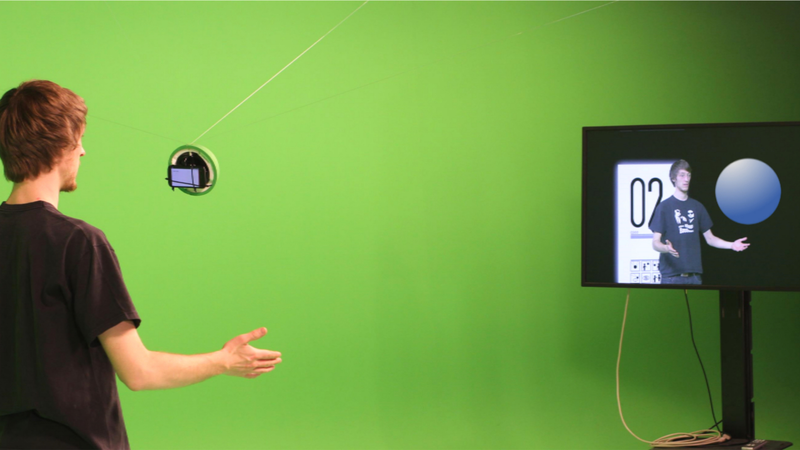 For displaying a position of a virtual object in all three dimensions, a rope based parallel manipulator was installed for testing purposes. It carries a green ball in the center as a replacement. The manipulator was programmed to communicate with the render engine to seek coordinates of a virtual object in real-time. The coordinates were then used to position the green ball accordingly. With this device, it is possible to show positions and movement of the associated virtual object. 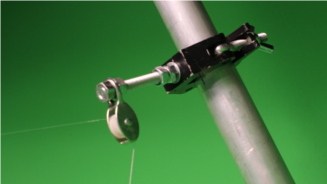 Through the balls' colour and the transparent ropes, the device can be keyed and therefore removed from the composed video. If demanded, it is possible to cover the ball with graphics or a virtual object. The setup can be seen in several videos, illustrating different applications. For comparability, the same tests were conducted in advance with a preview display only. Subsequently the tests were repeated with the SpiderFeedback alone. The evaluation was supported by markerless actor tracking for auto masking and triggering animations. A rope-based stage flight system is overlaid with visual effects for broadcast applications. Jeff Daemen, Peter Haufs-Brusberg, and Jens Herder, International Joint Conference on Awareness Science and Technology & Ubi-Media Computing (iCAST 2013 & UMEDIA 2013), HC-2013 Track, Hamamatsu/Aizu-Wakamatsu/Duesseldorf, November, 2013. Production at FH Düsseldorf Virtuellen Studio, SS 2013.